This week I am departing from my project slightly to transcribe a historical artifact of my own life. The Hebrew lunar calendar and the Civil solar calendar move around with respect to one another such that anniversaries on the lunar calendar are often able to sneak up on me unnoticed. 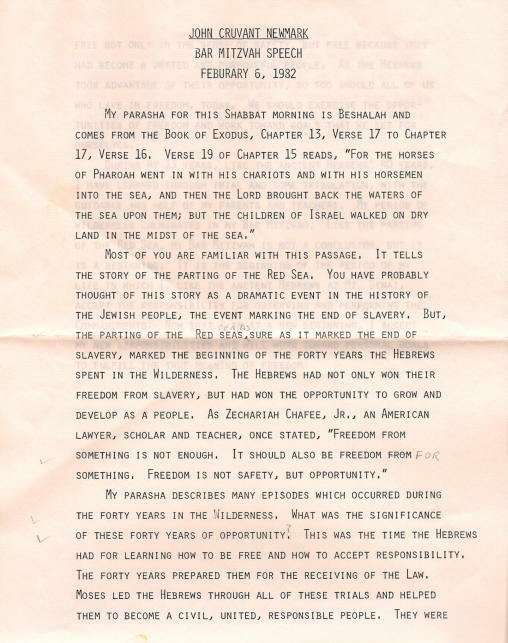 However, Jewish weeks are often identified by the Torah passage that gets read at the synagogue on Shabbat. 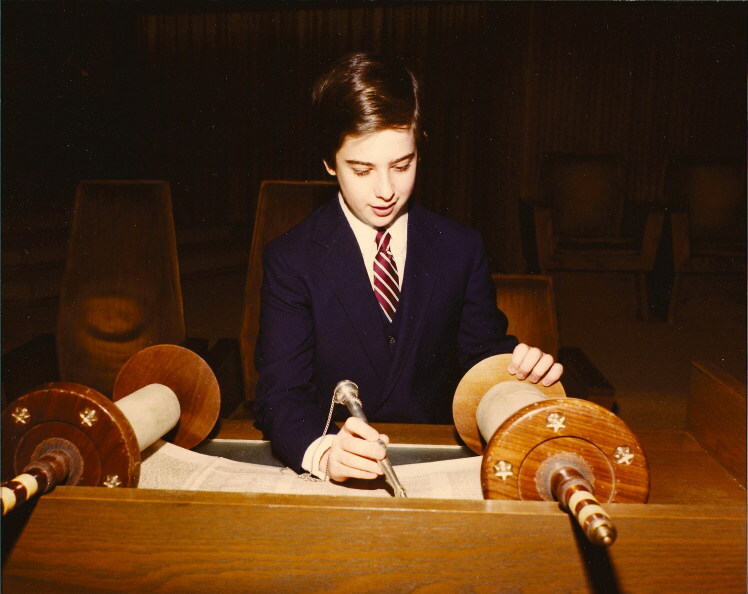 And this past weekend the Torah passage was the same as the one at my Bar Mitzvah 29 years ago, on Feb 6, 1982. The anniversary of the lunar date, the 13th of Sh'vat, is actually tomorrow, January 18th. 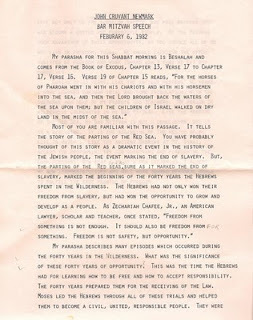 Below is the sermon/speech I wrote, and delivered at my Bar Mitzvah. (I received some editing help from my parents.) There are some edits within the text on the images that suggest this may not have been the final clean draft from which I read. My Parasha for this Shabbat morning is Beshalah and comes from the book of Exodus, chapter 13, verse 17 to chapter 17, verse 16. Verse 19 of chapter 15 reads, "For the horses of pharoah went in with his chariots and with his horsemen into the sea, and then the lord brought back the waters of the sea upon them, but the children of Israel walked on dry land in the midst of the sea." 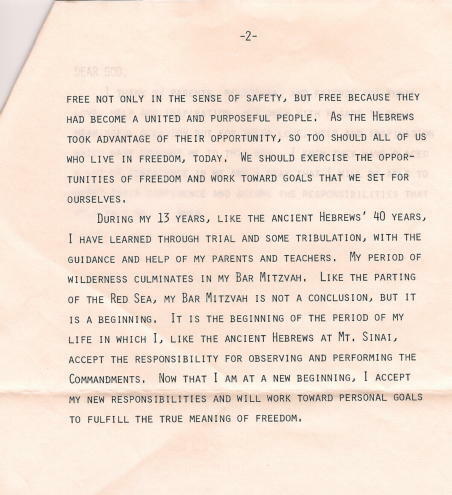 free not only in the sense of safety, but free because they had become a united and purposeful people. As the Hebrews took advantage of their opportunity, so too should all of us who live in freedom today. We should exercise the opportunities of freedom and work toward goals that we set for ourselves. During my 13 years, like the ancient Hebrews' 40 years I have learned through trial and some tribulation, with the guidance and help of my parents and teachers. My period of wilderness culminates in my Bar Mitzvah. Like the parting of the Red Sea, my Bar Mitzvah is not a conclusion, but it is a beginning. It is the beginning of the period of my life in which I, like the ancient Hebrews at Mt. Sinai, accept the responsibility for observing and performing the commandments. Now that I am at a new beginning, I accept my new responsibilities and will work toward personal goals to fulfill the true meaning of freedom. 1) If there is any doubt as to whether a 13 year old wrote this, the exclamation points in the second paragraph should remove all doubt. No, most 13 year olds don't go around quoting Zechariah Chafee, Jr. 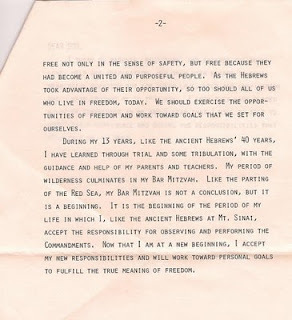 However, my parents had a copy of Bartlett's Quotations, and I remember I browsed through all the quotes mentioning Freedom until I found one that I liked. Wonderful! You were an insightful young man at 13. Good speech. Handsome young fellow!